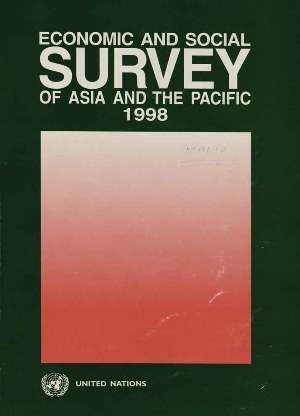 Economic growth in the developing economies of the ESCAP region decelerated appreciably in 1997. This was the result of the serious economic turmoil faced by several countries in South-East and East Asia. The redeeming features were that the countries of South and South-West Asia maintained robust growth, and that most of the Central Asian republics staged a significant recovery from the prolonged recession which had plagued them since the early 1990s. The turmoil which the economies of South-East Asia are confronting can be attributed to several factors. These including rising current account deficits, some deterioration in fiscal balances, rapid deregulation and liberalization of the financial sector without appropriate regulatory regimes or institutional infrastructure for effective supervision, and a policy stance focused on maintaining stable exchange rates along with open capital accounts. Foreign market players, such as bank leaders, hedge fund and mutual fund operators and speculators, also played a role in sowing the seeds of the crisis and then aggravating it through a herd reaction. National policy responses to pre-empt the emergence of such crisis in the future should include a more careful choice of policy targets and instruments, strengthening the financial sectors, developing markets and instruments to deal with risks in financial transactions, reducing the saving-investment, gap and enhancing export competitiveness. At the international level, the articulation of an international debt strategy and the establishment of a system of global governance of private financial flows merit serious attention. At the regional level, consideration should be given to the proposals for setting up an Asian Fund as a supplement to the IMF, use of regional currencies for intraregional trade, the establishment of an insurance scheme dealing with cross-border financial claims and cooperation in more effective management of financial sector institutions. The preoccupation with the immediate crisis should not undermine the commitment to the fundamental objective of long-run development: growth with equity. Policies towards poverty alleviation cannot therefore be delinked from the promotion of growth. In contrast, there is no firm relationship between growth and distribution of income, implying that there is no inherent trade-off between them. Policies that appear to promote growth and equity simultaneously include human resources development, enhancement of the productivity of the agricultural sector, development of small and medium-sized enterprises, wider access of women to education, improved child health care, and cost-effective implementation of target-oriented programmes.